Ipswich is the county town of Suffolk and is a major commercial centre in the east of England. 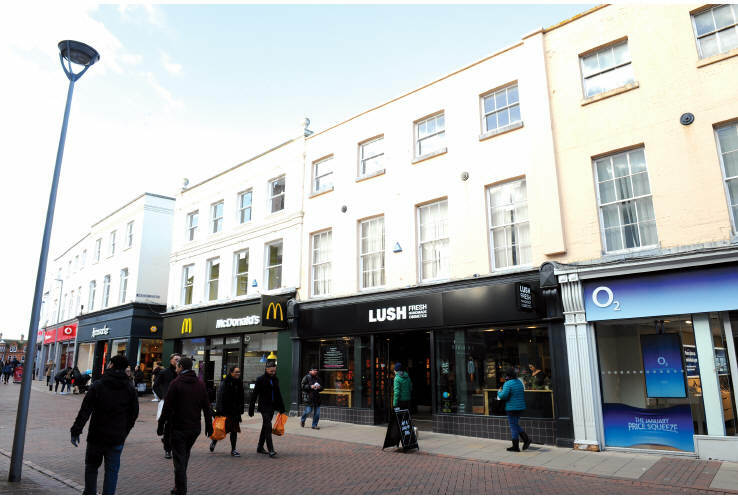 The property is situated in the heart of Ipswich town centre on the northern side of the pedestrianised Tavern Street, Ipswich’s principal retailing pitch. The Sailmakers Shopping Centre is within close proximity and houses occupiers including Boots, Pandora and Topshop. Other nearby occupiers include EE, O2, Costa, McDonald’s, Santander, Jack Wills and Superdrug. The property comprises a ground floor retail unit with ancillary accommodation on the first floor. The basement and second floor are currently not used by the tenant. (1) For the year ending 30th June 2017, LUSH RETAIL LIMITED reported a turnover of £139,921,000, pre-tax profits of £12,866,000 and a total net worth of £23,255,000 (Source: Experian Group 15/01/2019). Lush operates 105 stores in the UK as well as further stores internationally (Source: uk.lush.com 16/01/2019). (2) In 2016, by way of a deed of variation, the 2017 break option was removed, the rent was reduced from £80,000 p.a.x. to £73,000 p.a.x. and a cap of £80,000 p.a.x. was placed on future rent increases. For further information please refer to the legal pack.